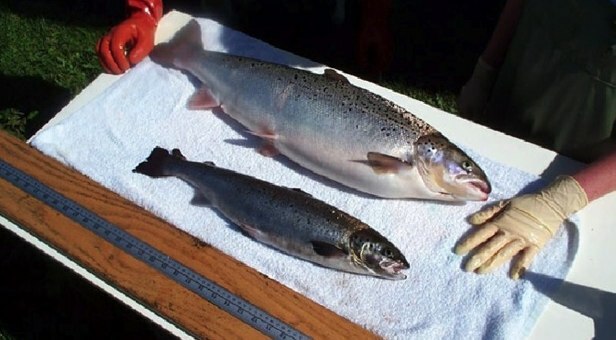 Genetically mutated salmon can be called the frankenfish monster. It is a dangerous threat to public safety and is unsafe because it has never been proven as safe. There are no long-term studies about humans eating this recently concocted genetically mutated creature. It's too late to submit a comment to the FDA about the genetically engineered salmon, but if they really wanted to protect public safety, they should demand long-term studies to prove its safety. These necessary long-term studies were never done. The name Franken-fish refers to un-naturally putting pieces of different bodies together to make something that would never in a million years evolve to be alive. Genetically engineered salmon has DNA taken from an eel-like creature (not a a fish) called an ocean pout. That DNA was blasted into the DNA of the salmon. This is an unnatural mixing of species. By combining this DNA, they have "created" a newly mutated "fish," just like Frankenstein created his "human" creature. The "Big Food" manufacturers Assn. is trying to kill your right to know if the food you’re eating is genetically engineered. With their anti-labeling allies like Monsanto and Dow, the Grocery Manufacturers Association (GMA) has teamed up with government to introduce a federal bill that would deny your right to know. The bill failed in early 2016, possibly because people became informed from articles like this, written by practicing doctors. But, the bill has craftily resurfaced - this dangerous bill was signed into law by president Obama. Nobody should gag your right to know about genetically engineered foods! Symptoms from eating their mutated food may not be limited to IBS (irritable bowel) at all! Monsanto was the single largest contributor against the recent Washington State ballot initiative to label GE foods. Between Washington State and California, Monsanto, along with the GMA and other agribusiness companies, have contributed over $67 million to keep consumers in the dark. If these huge companies (corporations) are not located in those states, why should they be able to plaster the airwaves in those states with their pre-election propaganda commercials? So what’s wrong with “voluntary” GE food labeling? It is grossly misleading for industry—let alone members of Congress—to continue trumpeting the idea that voluntary labeling will solve the overwhelming consumer demand for labeling in the marketplace. In the 14 years that FDA has allowed companies to voluntarily label genetically engineered foods, not one single company has done so. Not even one! Without mandatory labeling of GE foods, consumers are being left in the dark about the foods we are purchasing and feeding our families. In 2013, over 50 GE labeling bills were introduced in 26 states, including Hawaii, Washington, Indiana, Missouri, and Vermont. The industry-backed DARK ACT now cuts these state labeling bills off at the knees and replaces them with an undemocratic, hollow “voluntary” labeling scheme that does not address our needs, but only allows corporations to deny us our right to know. We must fight against genetically manipulated, genetically mutated, genetically mutilated, genetically altered foods! Why do they call it "genetically modified (GM), or engineered?" Because that's the name the makers of these abominations chose, so that it would sound nice when "modified" is mentioned in news or consumer alerts. A new species that has suddenly been genetically engineered will produce new foreign DNA. That new "transgenic organism" will produce new, foreign proteins, of which our immune systems have never encountered before, nor evolved to tolerate. Future long-term exposure to these new proteins without proper long-term testing is a dangerous experiment, and a crime to wage on the American population. The FDA should rely on independent and credible science that must include long-term studies, not on pseudo-science supplied by the corporation that stands to profit from govt. approval. Reject approval of any genetically engineered salmon or other GE "food" until the results of independent scientific studies can prove that long-term consumption of genetically engineered fish is without long-term effects and chronic health problems in consumers of such a new species. Additionally, reject approval until proper science can prove that it is harmless to the environment. There is no reason good enough to conclude that more of our rights be taken away from us. Now that new research proves that the levels of formaldehyde (a carcinogen) in genetically engineered soy are significantly higher than in natural varieties, and the level of a helpful molecule, glutathione, are significantly lower in genetically engineered soy compared to natural varieties, it would be an act of protection of Americans for you to oppose this bill, the grossly, misleadingly labeled "Safe and Accurate Food Labeling Act," and it would be an abomination if you were to support it. Please protect us and oppose this bill, the grossly mislabeled "Safe and Accurate Food Labeling Act"
We must demand the labeling of GE foods, to allow consumers to make an informed choice. The previous president's reign is over, but he signed the dark act into law. We wouldn't have the Dark Act as law without him. Remember, his political party is the overwhelmingly ruling party in California, and that party is the sole reason we have forced vaccinations without choice in California. 93% of the politicians in CA who voted for forced vaccination to become law were of the same party. Wake up Californians. The slick politicians you continuously vote for are behind forced vaccination in California. ·Farmed salmon are fed on oil and smaller fish, ground-up feathers and chicken fat, GM yeast, soybeans and a pesticide (yes, a pesticide as seen in a documentary film about farmed fish). ·Wild salmon get their color from eating krill and shrimp. The flesh of farmed salmon is gray, and is colored by syntheticastaxanthin, a manufactured copy of the pigment that wild salmon eat in nature.